As we reflect on 2018, City Connects has a lot to be thankful for. Together, our dedicated coordinators, community partners, school leaders, and City Connects staff provide students with the resources and relationships necessary to overcome barriers and thrive. We are grateful for City Connects Coordinators who go above and beyond every day to create safe and supportive school environments for all students. Earlier this month, C.J. McGowan, the coordinator at Ascension Catholic School in Minneapolis, facilitated a school wide anti-bullying initiative. C.J. collaborated with teachers and other school staff to develop creative anti-bullying lessons and activities, which allowed students from kindergarten to eighth grade to offer their opinions on how to stop and prevent bullying. The end result? An ongoing and open conversation with all students on why no one deserves to be mistreated. In June, Stephanie Sanabria, the Coordinator at Springfield’s Early Childhood Education Center, realized that many of her students and their families were facing various health problems without the necessary information and resources to address them. In response, Stephanie organized a health fair with mental health agencies, nutrition and dental programs, and youth development efforts. These organizations are now listed as community resources for the school’s families. We are also grateful for our community partners, who engage in significant collaboration with schools and families so that students can enter their classrooms ready to learn. Between June 2017 and June 2018, the Coalition for The Homeless delivered beds, sheets, books, and teddy bears to about 90 children in Springfield, Mass., as part of their A Bed for Every Child initiative. Many of these families were victims of local tragedies or hurricanes that hit Florida and Puerto Rico. Additionally, we are thankful for the many school leaders who work closely with students, school staff and community partners to ensure that all students have access to the supports they require to learn and develop positively. We are also thankful for City Connects staff who support the implementation and growth of City Connects and provide data that allows us to understand how our students benefit from comprehensive intervention. Lynne Sullivan, the Director of Implementation at City Connects, frequently collaborates with program managers and coordinators to ensure that they have the resources and tools necessary for implementing effective practices. Because of this communication between City Connects staff and coordinators, “students are getting the support they need early on,” Sullivan says, and the City Connects team learns how and where we need to improve. City Connects also works to improve its practice is by gathering feedback from students. 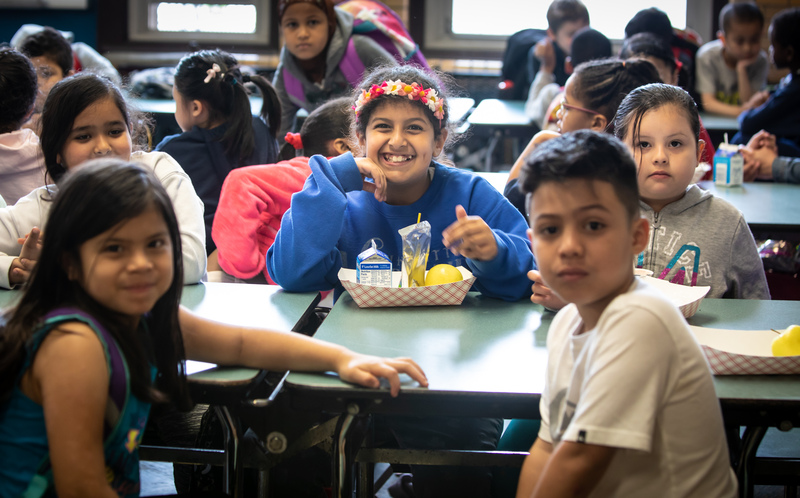 Stacey Razcek, Associate Director of Evaluation & Research at City Connects, emphasizes that a safe and supportive school climate is a prerequisite for student success. By administering a social competence survey to students in grades 3 to 5, City Connects evaluators learn about students’ attitudes towards school, feelings about their teachers, and perceived competence in math and literacy. Finally, we are thankful for our City Connects students – the inspiration for this work. As they grow and thrive, they are contributing to their communities in invaluable ways. Last May, students from the Collins Middle School in Salem, Mass., joined their coordinator, Brad Maloon, and walked in the annual HAWC 5K to raise awareness for domestic violence. Refusing to let the rain stop them, 6th, 7th, and 8th graders came together and raised $1,966 for this cause. From everyone at City Connects, we wish you a safe and happy Thanksgiving and look forward to continuing this work together!